The district currently owns and manages the Samsung Series 3 and Dell Chromebook 11 models of Chrome devices. While the hardware may differ slightly, the user software experience will remain the same. All district Chromebooks are centrally managed via the Google Admin console. This allows us to push specific settings to devices such as the wireless configuration, logon rules, and other organization wide settings. You will note the logon screen message indicating that the device is managed by our organization. A Chromebook will automatically power on when the lid is opened, if the lid is already open, press the top right power button. The device boot process will take approximately 5-10 seconds, and the device will automatically connect to our secure network, wps-wlan (while in the district within wireless range). You may briefly see a screen pop up that indicates it is connecting to wps-wlan, please do not disturb this process. Once connected you will be prompted to logon. You will be required to use an address ending in westport.k12.ct.us or students.westport.k12.ct.us. The full email address must be entered along with your WPS network password. Once logged on you will be brought to a Chrome desktop where all of your Chrome apps, bookmarks, and other browser settings will automatically sync. The sync process may take up to 20 seconds to complete. 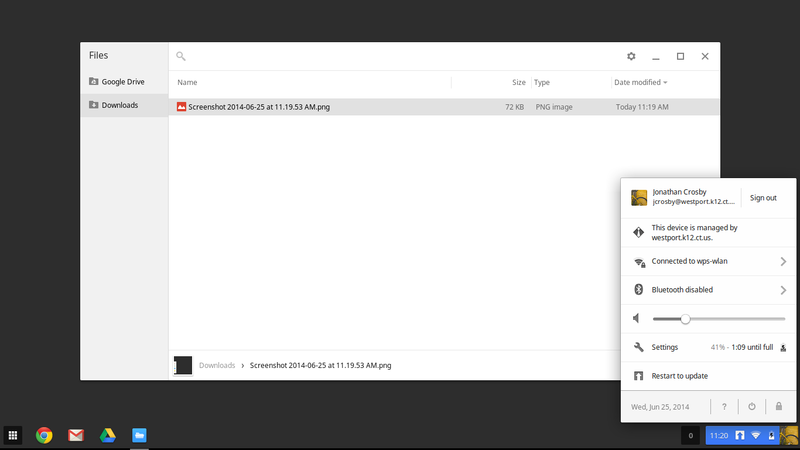 Due to the volume of users that use the devices, files stored in the Downloads folder (under Files) of the Chromebook are deleted. The device will also re-sync all of your settings at each login. If you anticipate that the same user will be using the same device, we can configure the devices so they do not clear stored information at each logout. This may save some post-logon processing time. 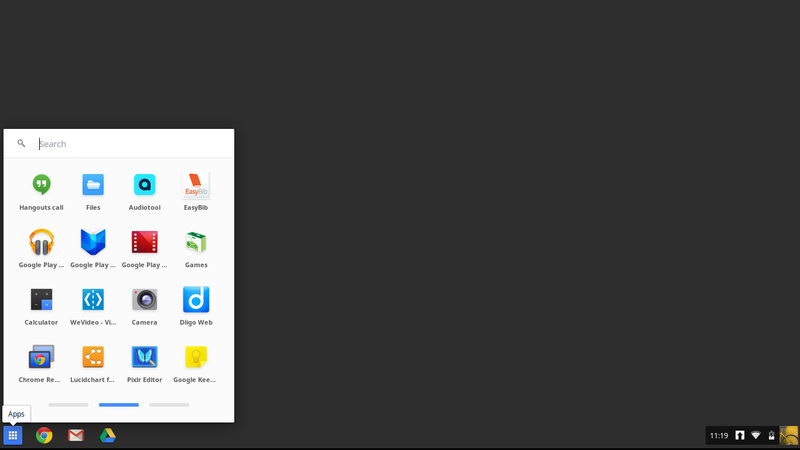 You can launch the Chrome Web Browser using the icon in the launcher toolbar. The app launcher in the bottom left will provide access to all synced apps. You can edit the app launcher, launcher toolbar, and desktop background; this information will all be synced per user. All applications you access will automatically be logged in based on the account you logged into the Chromebook with. The bottom right menu provides information about the device including time, wireless status, speaker volume, and battery level. This option also provides the logout/reboot option. An up arrow will be displayed if updates for Chrome OS are pending, however the device will not force a restart at any point. Chromebooks automatically update in the background. You will need to configure a wireless connection prior to logging onto the device. If the device is unable to connect automatically you will be prompted to manually setup a connection using the wireless network configuration tool.